In what has become a major retrospective of paintings by Ed Gray, this exhibition provides a unique opportunity to view a selection his London paintings spanning over three years and also looks to the future with three exciting new pieces. In ‘London & Londoner’s’ we see the subject which made Gray’s name; the city closest to his heart. 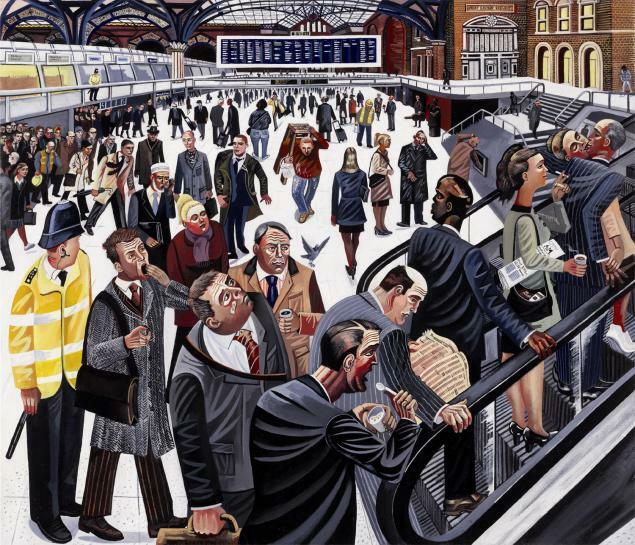 Over many years Ed Gray has depicted an unfolding pageant of lives lived in London. As documenter and story teller, his physical and emotional experience, immersion and compassion are clearly documented as we travel with him through the lives of his subjects. Viewing Gray’s paintings one is infused with recognition and familiarity. These are the daily lives of Londoners, yet instantly recognisable to anyone anywhere. The face of a stranger in the crowd as time stands still for a second, a private moment between lovers, the drama of an argument and the simple insignificant actions of daily life- loneliness and the struggle of the city are tempered by humour and human warmth. Sounds, smells, the dirt and light of the city burst from these epic canvasses as we see our own lives played out in insightful detail. His journey through the city continues at…. Ed Gray graduated from a Fine Art degree in 1995 and after a series of jobs to fund his desire to continue drawing and painting he trained to be a school teacher and taught art and design at a Peckham secondary school for four years. Increasingly Gray’s work was becoming commercially successful at home and abroad. In 2001 Ed Gray was awarded a sabbatical from his successful career as an art teacher to complete a Fellowship residency for the Masterworks Foundation of Bermuda, a museum whose collection houses work by Winslow Homer, Georgia O’Keefe. This experience led Gray to leave his teaching career and he has worked as a professional artist ever since. Primarily a painter of London, his birthplace, and inspired by artists such as Hogarth and Breughl and the Tintin cartoons of Herge that he loved as a boy, Gray has recently relocated to New York, Mexico and Tokyo to depict life in these cities. ‘I go out drawing in the streets to find characters to paint. These are real people, real moments in time, real depictions of the ebb and flow of city life. I aim to celebrate and commemorate these people; to leave a trace of these lives lived with my pen, my charcoal and my paintbrush’. In 2009 Gray was chosen to represent England for the official International Fine Art collection for the 2010 FIFA World Cup South Africa™. His depiction of Capetown township football match will feature in a touring exhibition that will travel from South Africa to New York, Tokyo and London. ‘Glitter and Grime’, a book written by Ed Gray and containing images of his work was published in 2007 by GXgallery, London, United Kingdom ISBN 978-0-9555879-0-0 and is available from GX Gallery www.gxgallery.com.